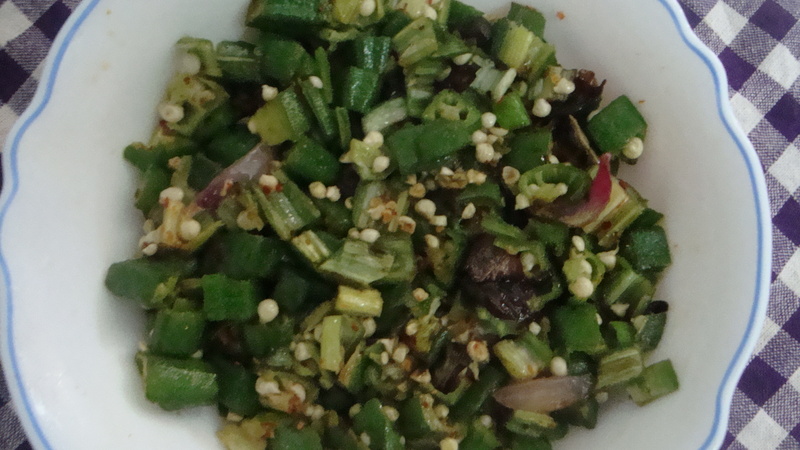 Today’s recipe is a simple and tasty okra dish. For a slightly different version, try okra stir fry. Clean the okra and finely chop them. Add some lime juice and salt to the okra and keep aside. Finely chop the onion, malu miris and curry leaves and fry them for about 5 mins in a tbsp of sesame oil. Add the finely chopped and seasoned okra slices to the frying pan and continue frying for about 10 mins over medium heat. Towards the end, add salt and pepper and optionally crushed chillies. I wanted to share one more palmyrah product this week. 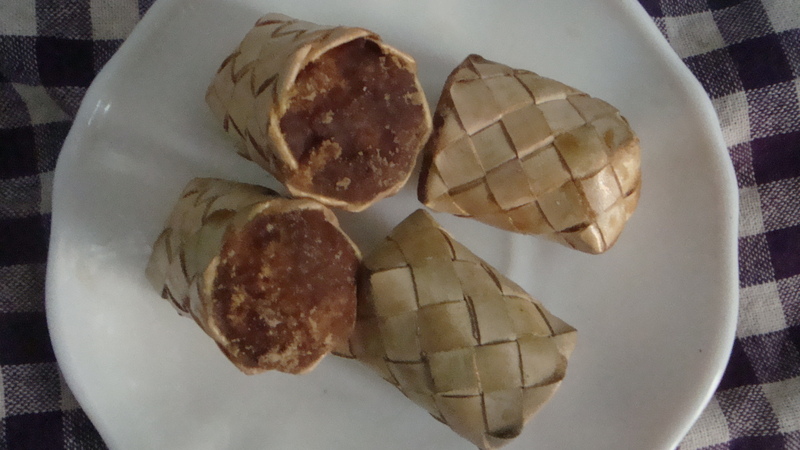 I will wrap up the palmyrah recipe series with ‘panangkatti’ or palmyrah sugar. During my great-grandmother’s time, ‘panangkatti’ was considered the regular sweetener for cooking and beverages and not the processed sugar of today. My mother recollects her grandmother serving her tea with a piece of panangkatti. Very rich in nutrients and a good source of vitamin B12, ‘panangkatti’ is considered particularly good for diabetic patients as well as those seeking to reduce their weight. Whenever I travel to Jaffna, I always try to bring my parents some good ‘panangkatti’ as the best in the country is available only there and both my parents are diabetic. While there are some people like my parents who prefer ‘panangkatti’ to regular sugar, its usage in the country has been on the decline over the last couple of decades. Therefore, its production has also reduced while the prices have gone up and it is now much more expensive than the regular sugar one can buy in any store. This is what my mother remembers of her grandmother’s recipe for making panangkatti, for those interested in knowing how it is made. The accompanying photo is of some ‘panangkatti’ that my mother had bought last week from Katpaham. Stir the palmyrah sap (palm water) continuously in the pot over medium heat, till it thickens beyond the consistency required for ‘paani‘. Add a tbsp of rice flour and continue stirring till its consistency becomes denser and it is no longer watery. Scoop a tbsp of the ‘panangkatti’ mixture into the woven palmyrah leaf thimbles and let it cool and set. Store the ‘panangkatti’ thimbles in an air-tight container. For some odd reason, I posted this on Oct 28th instead of Nov 28th so I am re-posting it today. I guess I have some pleasant memories of Thanksgiving dinners of past years that I tend to personally take note of the day. Last year’s Thanksgiving dinner was a memorable one with three special friends at Mount Kilauea, after we watched the crater eruptions from a very safe distance. My very first Thanksgiving dinner, a little over a decade ago, was hosted by a special vegetarian couple so much so that Thanksgiving food for me has since meant an opportunity to explore creative ways of incorporating pumpkin into everything from starters to dessert. So, today, I will share another of my mother’s pumpkin recipes. Remove peel of boiled pumpkin and mash it in a bowl. Add a bit of salt. Finely chop up the onion and green chilli. Add them to the bowl of mashed pumpkin. Add the pepper to the bowl. Mix well. Divide the pumpkin mixture into six portions. Mix 3 tbsp of wheat flour in some water to make a watery batter. Dip the pumpkin ball in the batter and then roll it in the bread crumbs so that the pumpkin cutlet is well coated. Repeat for each of the 6 cutlets. Set aside on plate while the oil is heated for deep-frying. Heat the oil over low heat. 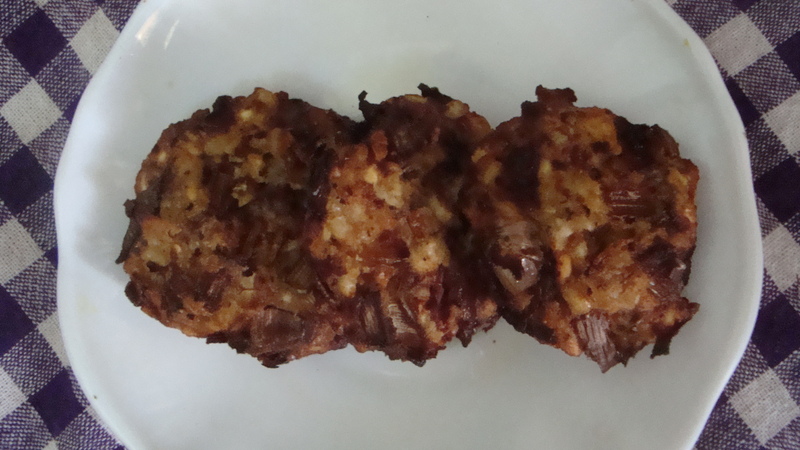 Deep-fry the cutlets until they are golden-brown. Transfer to a plate lined with grease absorbing paper and serve hot. ‘Panaattu’ is considered to have high levels of vitamins A and E. As far as my mother is concerned, it is something she has been fond of ever since she was a toddler. She bought a slab of ‘panaattu’ from the Katpaham outlet here so that I could take a photograph but she finds that it does not have the colour or consistency that her grandmother’s used to have. It is the first time that I have tasted ‘panaattu’ so I can’t compare. Here’s the method my great-grandmother used to make panaattu, as remembered by my mother from her childhood days. I am sharing it for those who are interested in knowing what or how ‘panaattu’ is made and for those who happen to have some palmyrah fruit and wish to try making some panaattu. For more ways that the palmyrah is used in the north of Sri Lanka, check out my earlier post on its background. Coconut oil, for coating the ‘panaattu’ layer. Peel the very ripe palmyrah fruit and then mix repeatedly with just enough water to be able to make the fruit pulp. Strain the pulp through a clean cloth. Spread the collected pulp as a thin layer over a woven palm mat and let it dry under the sun. Cover the mat during night. The next day, add another thin layer of palmyrah fruit pulp extract over the dried layer and continue to sun-dry. Repeat this process for 10 days, adding new thin layers each day till the thickness of the ‘panaattu’ is around ½ inch. Let the ‘panaattu’ dry under the sun till it reaches a maroonish-orange colour and can be cut through with a knife without it sticking to the knife. Slice the long panaattu roll into manageable pieces. Apply a little coconut oil and fold the cut pieces. Taking a woven palmyrah leaf container/ box, stock up the cut and oiled panaattu pieces. This can be then stored for a long time. 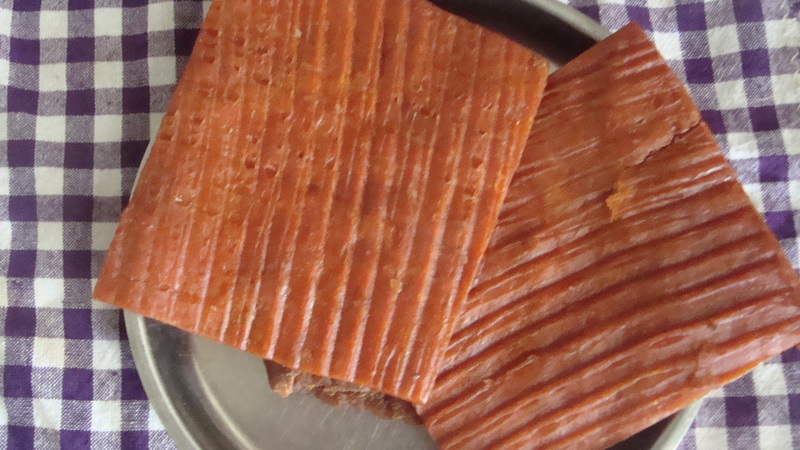 My great-grandmother used to store the box of panaattu on a shelf above her cooking stove. 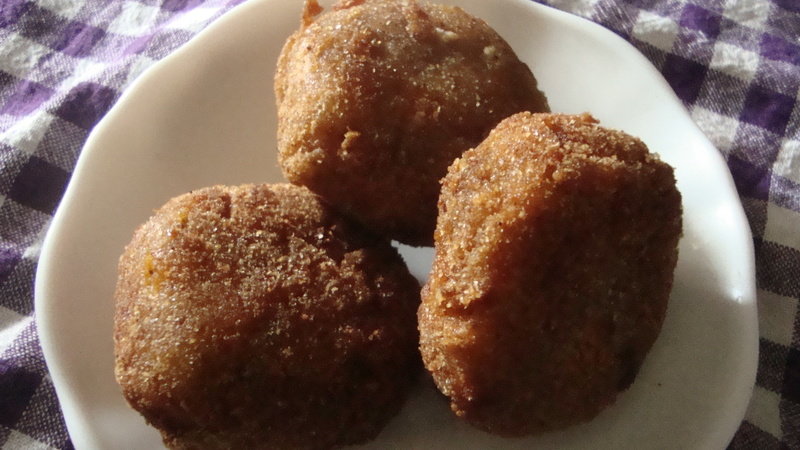 Serve a piece of panaattu with tea or make some paani panaattu from it. Two of my mother’s favourite snacks from her childhood days are ‘panaattu‘ and ‘paani panaattu’. She remembers her grandmother making them for their home consumption and storing them in little jars or earthen pots. When my mother and her sisters visited her, she would serve them these treats with tea or after a main meal. It is much easier today to buy a jar of ‘paani panaattu’, from the Katpaham outlets around the country, as my mother did this weekend. However, as palmyrah used to be and is still considered an intrinsic part of the north Sri Lankan culture and cuisine, I do like to know and share the recipes of how these traditional delicacies are made. My mother felt that the ‘paani panaattu’ that she had bought didn’t quite taste the way she liked so she revamped it with the spices she remembers her grandmother had used. It was the first time that I tried ‘paani panaattu’ and I think this is another dish that is an acquired taste. 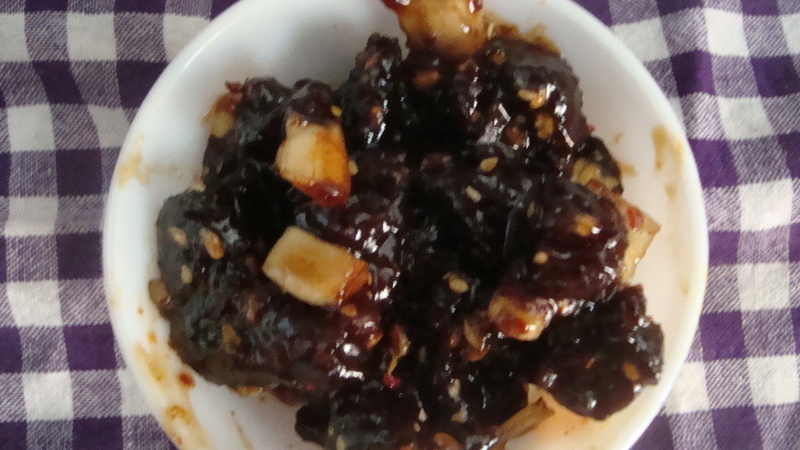 It has quite a strong taste and is both spicy and sweet at the same time. My mother was delighted to go back to her childhood memories and favourite snacks while I enjoyed recording both recipes, as she remembered from her observations of my great-grandmother. The palmyrah sap is collected by tying a pot to the stem of the palm flower stump after it has been cut or gashed to allow the sweet water of the palm to be collected. To prevent fermentation, a little lime is added to the pot. This water that is collected is non-alcoholic, due to not being fermented, and it is considered nutritious particularly for the elderly. The collected palm water is then heated and continuously stirred till it thickens into a brown treacle like substance called ‘paani’ . ‘Paani’ is usually stored in an earthen pot and it can be stored for a long time. Chop up the panaattu into small pieces. Heat the paani in a saucepan over low heat for about 3 mins. Add the crushed chillies and cumin powder and stir well for about 2 mins. Add the coconut chips and roasted rice to the saucepan for about 1 min. Then, add the panaattu pieces and stir for about 2 mins. Stir well until it thickens and remove from stove, to allow the ‘paani panaattu’ to cool before serving. When making in larger quantities, transfer to an earthen pot or air-tight jar. My mother made a few dishes that she really likes, and which are specialties of Jaffna cuisine, this weekend so I will be sharing the recipes of those this week. Today’s recipe is that of vadaham, a sun-dried and fried side dish made of some special ingredients. Vadaham is usually made in bulk during sunny days and preserved to be eaten over a long period. There are a few varieties of vadaham, the more popular ones made of neem flowers (vepampoo) or banana flower (valaipoo). The neem tree is considered one of the most medicinal trees and the flowers particularly good for diabetics. My mother tells me that she learnt how to make vadaham by observing her aunt (my grand-aunt) making them. My grand-aunt was fond of the neem flower vadaham and she had mats placed around the neem tree at my grandmother’s house to collect the tiny flowers that fell off the tree. The flowers were then rinsed and dried before being used to make the vadaham. The recipe I am sharing below is my grand-aunt’s recipe that my mother occasionally uses when she feels like making vadaham. Soak the urad dhal for about 3 hours and then drain and grind the dhal. Mix the finely chopped banana flowers with the ground urad dhal in a mixing bowl. Add to the mixing bowl the crushed chillies, onion, cumin powder, turmeric as well as pepper and salt to taste. Mix well and then make small, circular disks of ‘vadaham’. Sun-dry the ‘vadaham’ for 2 or 3 days and then bottle them in an air-tight jar. If you do not plan to make in bulk and are preparing the side dish for a meal within that day, you can omit the sun-drying part and directly make instant vadaham by moving on to the next step as my mother did this weekend. Some also prefer to simply use the sun-dried version directly without frying them. 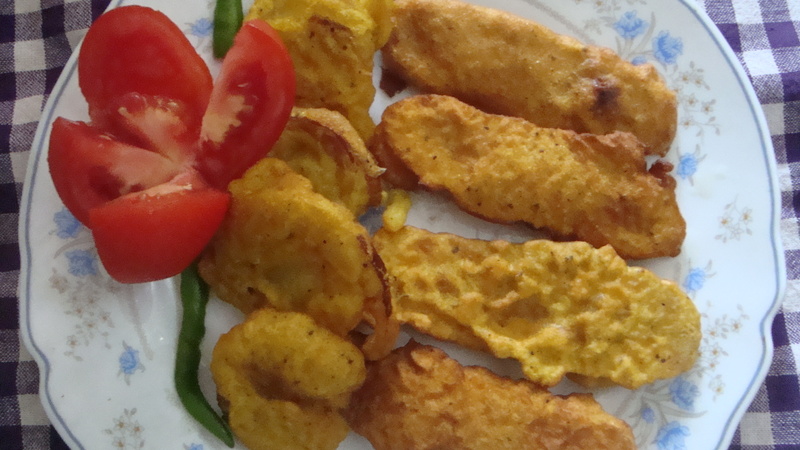 When you wish to serve them, simply deep-fry the required number and serve warm with rice and some curd and pickle.